A biographical note and a list of works of this forgotten painter-etcher. Color etching by Gaston Eychenne. Bibliothèque Nationale de France, Département des Estampes, Paris. Gaston Eychenne (more exactly Ey'chenne, a spelling fantasy which does not help spreading a name in the digital age) was born in a working-class family in Paris in 1873. His paternal grand-father was an Ariège peasant. Gaston received little official art education, but learned first from a family friend, then from an old miniaturist, Cournery (probably Louis Cournerie, 1820-1897). First working as a bank clerk for a living, he started a full-time artistic carrier around 1899, with the help of his friend Georges Godin. 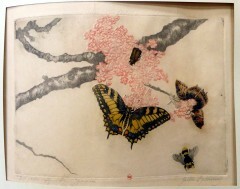 He devised original colour etchings of great delicacy which were published by Ch. Hessèle and exhibited at the Salon de la Société Nationale des Beaux-Arts in 1901 and 1902. Eychenne died in May 1902 in Saint-Germain-en-Laye. Color etching by Gaston Eychenne, published by Ch. Hessèle. Former collection G. Mellerio. For the tenuous connection between Ey'chenne and Brouet, see the following post.